“… The Bussey building is still buzzing with lively commercial activity, as part of Copeland Industrial Park. This is tucked away behind Bournemouth Road and Rye Lane, and hosts many small businesses, including some 100 artists, several faith groups, and arts, music and exhibition spaces. These contribute to the emerging Copeland Cultural Quarter. It is part of the large seven acre site, stretching from Rye Lane to Brayards Road, designated for demolition for the Cross River Tram depot. Following the successful Open House Weekend last year (see last year’s blog) people flocked again to take the Open House weekend walks led by The Peckham Society on Saturday and Sunday 20th and 21st September 2008 (see photos). This time there were around 100 on two walks. Again everyone enjoyed the magnificent views of Peckham and central London from the roof of the Bussey building. They enjoyed the refreshments in the CLF Arts Café and the Peckham Vision exhibition of the latest information about the tram & tram depot plans, and the ideas for that central area of Peckham town centre if the tram depot is not located there. 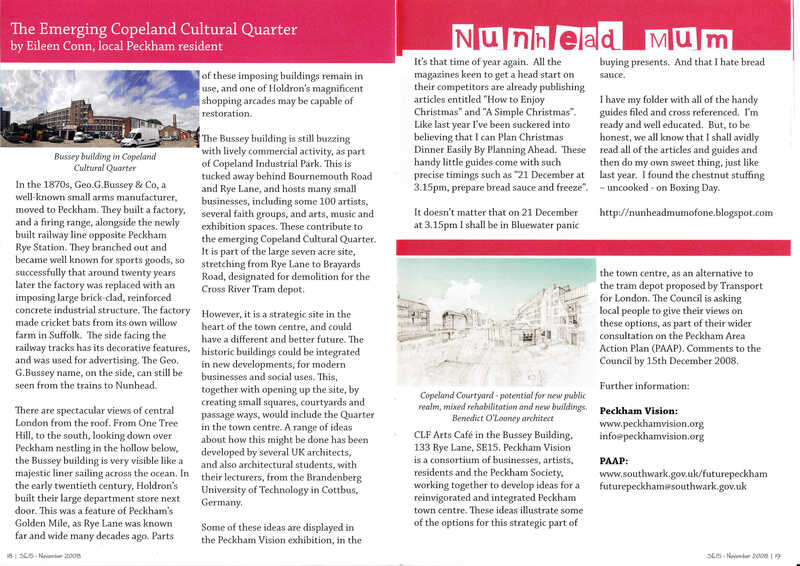 The new images and plans for the emerging Copeland Cultural Quarter were included in the displays. They heard how the huge size and good solid condition of the historic Bussey building is providing spaces for new creative arts and music businesses. the way all that would complement the opening up of the piazza in front of the fabulous gem of Peckham Rye station (listed finally this year to protect it for the future). TfL’s plan to locate the CRT depot in Peckham town centre will destroy self-generating renewal. There needs to be a full public review now of all the potential CRT depot sites to examine the full regeneration impacts. Mid-Southwark needs improved transport. There should be an early new dedicated Express Bus or Shuttle service which follows the CRT route. This would help the planning for the CRT and other improved transport for Peckham and surrounding area. The CRT must continue to be a cross river tram and get across the river in its first phase to Euston and Kings X. At the seminar Tfl revealed that the cost of the tram had increased to £1.3bn, and that there had been no money in the budget anyway for the previous cost of £800m, and that even if there were the money the date for the operation of the new tram would now be 2018. The committee resolved to push for the examination of all sources of funding to ensure that the tram project is not shelved, and will discuss this at the next meeting on 16th October. In the meantime, as there are 10 years before there could be a tram even if TfL had the money to build it, why don’t they install a new express shuttle bus NOW on the tram route to improve our transport across the river to central London, and use it as an excellent test and demonstration of the case for the tram? 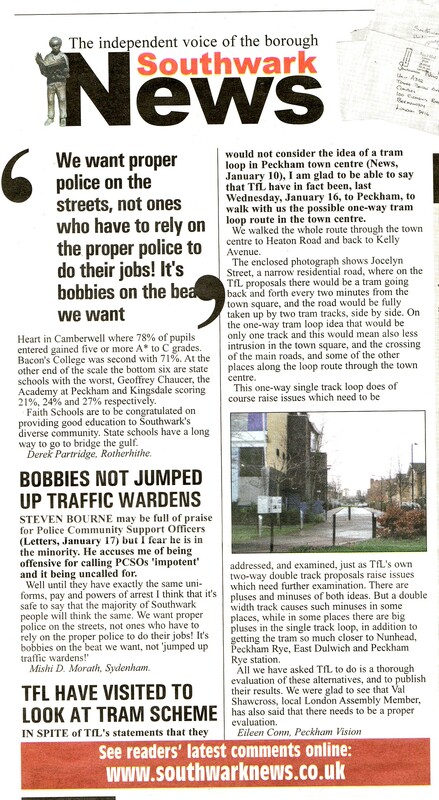 See full letter press cutting or Southwark News website. South London Press report that Transport for London (TfL) have walked the tram loop route around Peckham town centre with Peckham Vision. This identified a number of issues which would have to be examined, just as with TfL’s own proposals. Peckham Vision urged TfL to do a thorough technical evaluation and publish the results with the evaluation of their own proposals. See the press cutting here. It has been reported (SLP 7th December) that TfL are rejecting the idea of a tram loop round Peckham town centre. Peckham Vision has asked Val Shawcross, the London Assembly Member for Southwark & Lambeth, to press the Mayor, Ken Livingstone, to intervene to get TfL to discuss the idea with the local community. We are astonished that TfL appear to reject the idea without any discussion. During the TfL consultation on the route last December/January, TfL promised to come back to the local community to discuss particular details. Now they appear to be saying they will take decisions without any further discussions. The number of tram crossings would be the same with the TfL and the loop proposals – two crossings of the High St. The impact on traffic might even be less with the loop as the number of tram movements in one place would be halved. The relatively small extra route length would bring the tram in walking distance of thousands more people in Nunhead, Peckham Rye & East Dulwich, and bring it directly outside Peckham Rye station. The benefits of the single-track compared with the double-track might outweigh the greater road sharing – half the number of trams on more roads might have less impact on traffic. Southwark Council have asked TfL to investigate it. TfL can’t do that properly without discussions on the ground with local people who are familiar with the streets concerned, and with the proposal. Even better variations on the idea might emerge from such constructive local discussions. This idea really deserves thorough discussion with TfL on the ground. “Members of campaigning group Peckham Vision have called for the proposed Cross River Tram (CRT), which is set to terminate in Peckham, to instead run on a circle line-style route through the area. The group’s latest newsletter calls for the change, saying running two tracks alongside each other would cause “great difficulties” in the area’s crowded streets and a single track circular route would be less disruptive. Eileen Conn, a member of Peckham Vision, said: “A one-way system seems to work well in Croydon town centre.” A single track would be much less disruptive than a double track.